- Return 1 card on the field to its owner's hand. - See 1 card on the top of your opponent's Deck. Your opponent does not see the card. Then return it on the top or the bottom of your opponent's Deck. Chick the Yellow... heh. He's not even a chick... I think XD. Yellow is not horrible. First of all it's stats aren't great so if you are using a beatdown you get better results with a White Magical Hat. The effect is intresting. The first one is when you inflict lifepoints return a card to your opponent's hand. I actually like that it's card not monster. With card you can return those nasty traps like Judgment of Aunbis or Ring of D. Also get rid of those pesky Jinzos or Vampire Lords. The second effect is much to situational. Unless you top cards for some reason don't use it's second effect unless he/she has no other cards on the field. Conclusion: I now summon my boy chick! - Return 1 card on the field to its owner’s hand. - See 1 card on the top of your opponent’s Deck. Your opponent does not see the card. Then return it on the top or the bottom of your opponent’s Deck. The worst of the Dark Scorpions. Chick contributes to the DSB Combination however. And the DSB combination promotes a needle worm effect, which we will discuss later on. Chick's stats are poor and will not survive in the current meta. 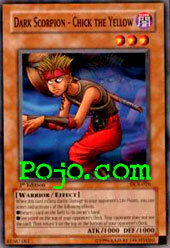 His effect is not worth the attack, if you're going to use it, put him in a devoted DSB deck. That is all he is good for.